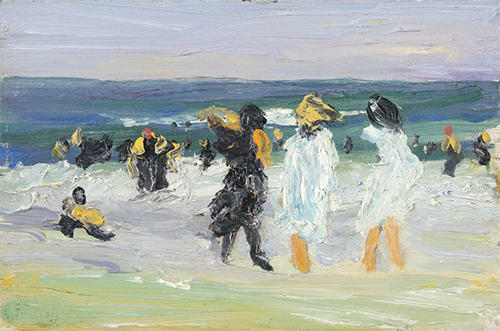 A painter most remembered most for his beach scenes of carefree atmosphere, Edward Potthast was one of the significant 19th-century American artists from Cincinnati, which at the time of his birth was a burgeoning art center and a place of refuge for German immigrants including the Potthast family. He first studied at the McMicken School of Design and at the Cincinnati Academy, and then went to Europe briefly before becoming established in his native city as a lithographer and illustrator. In 1892, he moved to New York City where he won the Clarke Prize at the National Academy of Design and many other honors. In 1910, he was part of a Santa Fe Railroad sponsored trip to the Grand Canyon that included Thomas Moran. The group spent ten days painting on the South Rim of the Canyon, and this experience was so stimulating to him that he returned to the West several times, developing a tonalist style of painting night scenes. Apparently he also traveled to California, as several of his paintings are of Catalina Island according to the book The Enchanted Isle and verified by a resident of Catalina. His studio was primarily in New York City, but in 1912, he spent extensive time in Europe where he enrolled in Academies in Munich, Antwerp and Paris. He divided his time between illustrations for Harper’s” and Scribner’s magazines but later gave up illustration for full time fine art. He was an exceedingly private person who died at his easel. Mabel May Woodward, painter, craftswoman, impressionist, was born in Providence, Rhode Island on September 28th, 1877. Woodward first studied at the Rhode Island School of Design, and later she studied at The Art Students’ League in New York under Frank Vincent Du Mond, Kenyon Cox, and William Merritt Chase. 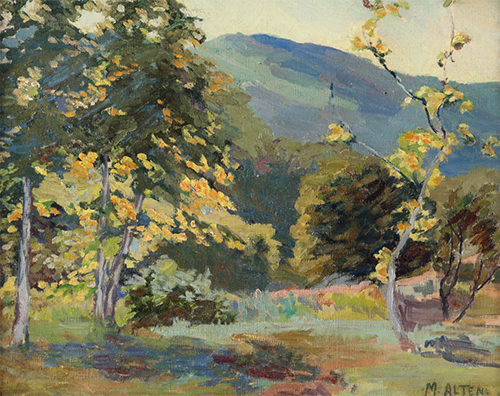 She also studied under Arthur Wesley Dow and Charles H. Woodbury at the Ogunquit School of Art. During her career she often cited Frank Du Mond, with whom she painted in Old Lyme, Connecticut, and William Merritt Chase as the major influences on her artistic career. Chase’s influence is particularly noticeable in her work. Woodward like Chase often painted out doors in a Plein-Air Impressionistic manner. Her colorful canvases display her master’s brush-work, bold, crisp, unlabored strokes and a mastery of the effects of light and shadow often with a heavy impasto. Her subject matter was often her beloved native coastal New England, with the airy landscapes, towns and beaches. She was also known for genre, European scenes, villages, farms, still lifes and flowers. Providence, Rhode Island, her hometown, was a mecca for artists at the time she was growing up, and the many noted artists painting there at the time no doubt influenced her work as much as the pleasant scenery she was accustomed to. 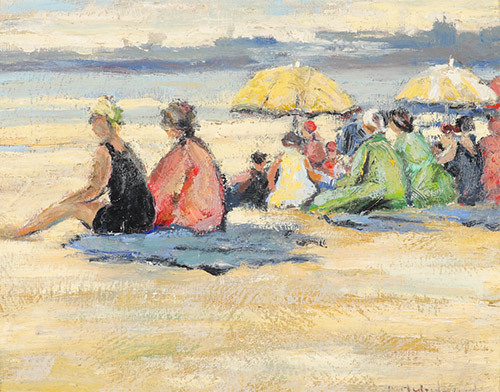 Although she traveled and painted in Europe, she remained a daughter of Maine her entire life spending most of her summers in Ogunquit, a major center of art. Woodward was a long-time faculty member at the Rhode Island School of Design, where she pioneered the “The Action Class” a study of the human figure as a machine rather than a stationery object. She was also a member of the Providence Art Club, where she had a highly-praised “one-woman” show; a member of the Providence Watercolor Club; South County Art Association; Ogunquit Art Association and others. She died August 14th, 1945. Born in London, England, Dawson Dawson-Watson was a landscape, portrait, genre, marine, and mural painter and graphics artist who was the son of a popular English illustrator. He attended grammar school at Southsea, Hampshire. His first art teacher was Mark Fisher, with whom he studied in Steyning, England. A wealthy local brewer then sponsored Dawson-Watson’s art training in Paris that included classes with Carolus Duran. While in France, he also studied with Louis-Joseph Raphael Collin and Pierre Paul Leon Glaize. The artist lived in Giverny, France near the home of Impressionist Claude Monet for five years, 1884 to 1890, and in 1888 married an American women, Mary Hoyt Sellar, who was traveling in Europe. They came to the United States in 1893 at the encouragement of artist James Carroll Beckwith, and Dawson painted in New England until 1897. He was hired as director of the Hartford Art Society in Hartford, Connecticut. In 1897, he returned to England but was not successful at making a living, and he also spent three years in Canada. 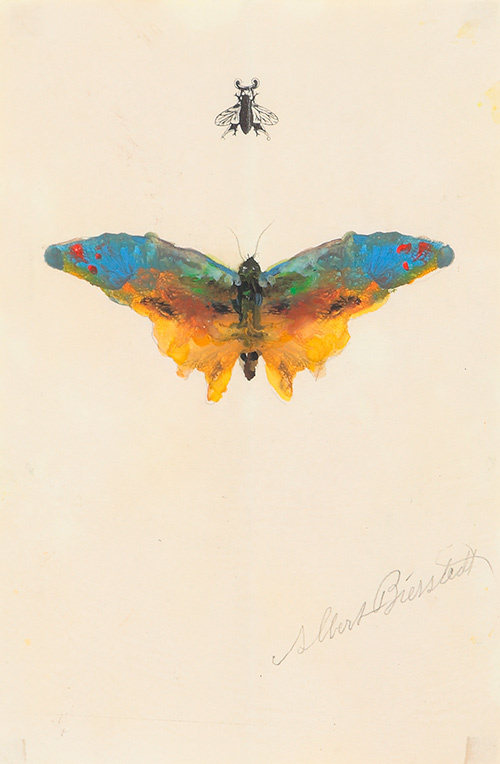 Returning to the United States, he taught from 1903 to 1904 at Byrdcliffe Colony, a center for the Artist and Crafts Movement in Woodstock, New York. This period was followed by teaching for eleven years at the St. Louis School of Fine Arts, serving as art director of a pageant in Brandesville, Missouri, and in 1918, serving a year as director of the San Antonio Art Guild. In 1926, he settled permanently in San Antonio, encouraged by members of the San Antonio Art League, and he participated in many exhibitions, often winning prizes, including first place ($5,000) at the 1927 Edgar B. Davis Competition. He also painted the Grand Canyon in Arizona. Murals includeMeditation in the Thomas Jefferson High School in San Antonio, and The Open Book of Nature at Wichita High School in Kansas. In the 1920’s he emigrated to the United States, initially residing in New York City where he painted Broadway backdrops, and eventually setting up studios in Rockport, Massachusetts and St. Augustine, Florida, seasonally moving from one to the other. Anthony Thieme’s work is held in high regard by collectors and Museums alike, and he is represented in many major collections: Boston Museum of Fine Art; Pittsfield Museum of Art (Massachusetts); Albany Institute of History and Art; Dayton Art Institute; City of New Haven Collection; College of Springfield (Utah); University of Iowa; Museum of Modern Art; Los Angeles Museum of History, Science & Art; Beach College, Storrs, Connecticut; Montclair Art Museum (New Jersey). 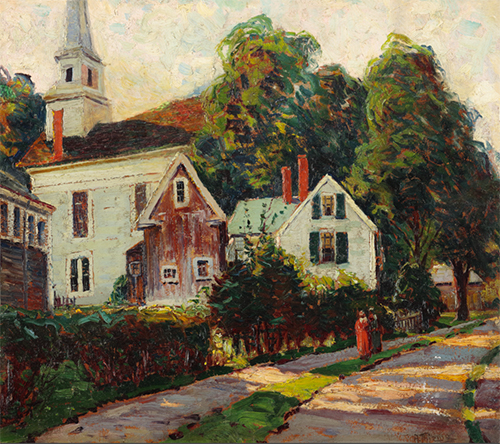 A marine painter, Anthony Thieme eventually settled in Rockport, Massachusetts where he established the Thieme School of Art and became one of the area’s most prolific painters. 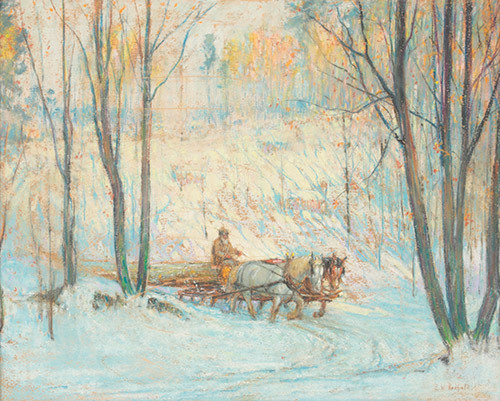 Born in Louisville, Kentucky, Paul Sample established his reputation as a Regionalist landscape, figure and genre painter, particularly of New England subject matter. He was raised in the Midwest and attended Dartmouth College in Hanover, New Hampshire, where reportedly he slept through art appreciation courses because he was much more interested in sports and music. He served in World War I in the Navy, and returned to graduate from Dartmouth. Shortly afterwards, he got tuberculosis, which led him to art because it was a more sedentary activity than his previous pursuits. In 1925, he moved to California and enrolled at the Otis Art Institute where his teacher was Jonas Lie, and he took private lessons from Stanton MacDonald-Wright and Frank Tolles Chamberlin. By 1926, he was a faculty member at the University of Southern California, where he then chaired the art department. His quick acceptance launched his career; he spent his summers painting in Maine and Vermont. During this time, he developed his unique style inspired by the Dutch master Pieter Bruegel the Elder and by influences of the American-Depression art movement called “Regionalism,” an affirmation of American life. 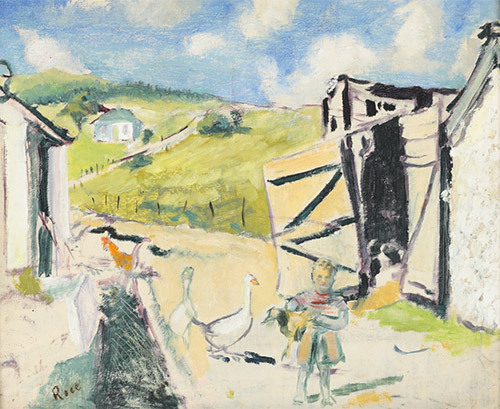 In 1938, he moved permanently to New England and became artist-in- residence at Dartmouth College. He lived with his wife and son in Norwich, Vermont, while maintaining his studio in Hanover, New Hampshire. In 1940, he was elected to the National Academy of Design, where he had already won many exhibition prizes, and major museums and collectors obtained his work. During World War II, he also did illustrating of naval activities for Life magazine. After the War and until he retired in 1962, he did numerous New England landscapes as well as murals, portraits, and illustration ads. A painter of Fauve or brightly colored landscapes, coastal scenes, figures, and portraits, Anne Rice was born in Philadelphia and studied at the Philadelphia Academy. She received a diploma in 1897 from the Pennsylvania Museum & School of Industrial Art (PMSIA, now The University of the Arts College of Art and Design). She exhibited at the Art Institute of Chicago, the Salon d’Automne in Paris, and in London at Baillie Gallery. Additional information courtesy of Sara MacDonald, Public Services Librarian, The University of the Arts, whose sources are PMSIA commencement programs, annual reports. Born in Bridgeville, Delaware, Edward Redfield moved to Philadelphia as a youngster and lived much of his life near New Hope in Bucks County, an easy distance north of Philadelphia. There he became the leader of the colony of artists known as the New Hope Impressionists. In modified Impressionist style and methods, he did many landscapes, especially panoramic snowscenes of the area, and used thick paint applied to large canvases with long brush strokes instead of the feathery strokes of true French Impressionism. He usually finished his paintings in “one go” meaning plein-air, sometimes strapping his canvas to a tree on blustery days and standing knee-deep in snow. In the summers, he painted at Boothbay Harbor, Maine. He was also a teacher at the Pennsylvania Academy and a skilled craftsman who built his own house, cabinets and restored antiques. Redfield took his early training from a Mr. Rolf in order to pass the examination at the Pennsylvania Academy, where he studied from 1885 to 1889 under teachers including Thomas Anschutz, James Kelley, and Thomas Hovenden. A fellow student was Robert Henri, with whom he developed a strong friendship, and with whom he traveled to Paris in 1889. In Paris, he studied at the Academie Julian and the Ecole des Beaux Arts and his teachers were Adolphe Bouguereau and Tony Robert-Fleury. However, he wearied of the pervasive academic styles at these schools, and spent much time painting landscapes in the Forest of Fountainbleu outside of Paris. He also painted at Barbizon and Pont-Aven. He exhibited extensively throughout the country and abroad, and won an impressive array of awards, including a Bronze medal, Paris Exposition (1900); Bronze Medal, Pan-American Exposition (1901); Temple Medal (1903), Jennie Sesnan Gold Medal (1904), Gold Medal of Honor (1907), Lippincott Prize (1912), and Stotesbury prize (1920), all from the Pennsylvania Academy of the Fine Arts; Silver medal (1904), St. Louis Exposition; Fischer Prize and Gold Medal (1908) form the Corcoran Art Gallery, Washington, D.C.; Honorable Mention (1908) and Third Class Medal (1909), Paris Salon; Palmer Gold Medal (1913), Chicago Art Institute; Hors Concous Prize (1915), Panama-Pacific Exposition in San Francisco; Carnegie Prize (1918), Altman Prize (1919), and Saltus Medal (1927), National Academy of Design. His paintings are included in numerous museums and public collections throughout the country, such as the Boston Museum of Art, Brooklyn Art Institute, Carnegie Institute, Chicago Art Institute, Corcoran Gallery, Los Angeles Museum, Metropolitan Museum of Art, National Gallery of Art, Pennsylvania Academy of the Fine Arts, and the Philadelphia Museum of Art. Towards the end of his life, he burned hundreds of paintings that he regarded as inferior. He died in 1965 in Center Bridge, Pennsylvania, and his work received little attention during the decade following his death. However, he has come to be regarded as a key American Impressionist and appreciated for his influence at New Hope. 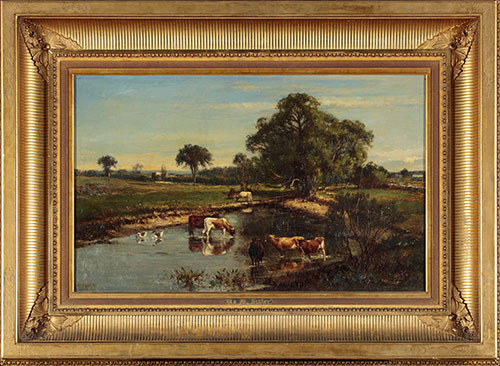 Influenced by study with the great George Inness to become a landscape painter, William Mark Fisher, born in 1841 in Boston, also studied as a youth at the Lowell Institute in Massachusetts. Fisher went to Paris as a young man of twenty to study with academic artist, Charles Gleyre. In France, he was influenced by Monet and the other artists who would later be known as Impressionists. Unfortunately, Fisher was unable to find any success upon his return to Boston after some years in France. In 1877, he went to England and rapidly became one of their foremost painters of realistic landscape and animals. Like poet Robert Frost in the 20th Century, another American under-appreciated in his own country, Fisher achieved such a reputation in England that his fellow artists elected him to full membership in the Royal Academy, the New English Art Club and president of the Essex Club. Fisher exhibited in expositions in Chicago, St. Louis and Paris, winning medals. The artist’s works in the collection of the Museum of Fine Arts in Boston include “Noon,” 1872, “On the Cam,” 1876, and “The Meadows,” 1877. “Feeding the Fowls” is in the Tate Gallery in London. William Mark Fisher died in 1923. Likely the most famous and financially successful late 19th-century painter of the American western landscape, Albert Bierstadt created grandiose, dramatic scenes of the Rocky Mountains and Sierra Nevadas that lured many people to visit those sites. He was also one of the first artists to use a camera to record landscape views. His oil paintings, many of them huge, were the ultimate expression of the popular 19th-century Romanticism. But his reputation diminished when public taste in art changed dramatically and replaced Realism and Romanticism with Impressionism and when transcontinental railway travel revealed that the West looked nothing like his idealized paintings. Bierstadt was born in Solingen, near Dusseldorf, Germany, and sailed as a baby with his family who settled in New Bedford, Massachusetts. Unlike many of his successful peers, as a child, he showed only casual interest in and talent for art, and he had little encouragement from his family. In New Bedford, he acquired a few collectors of his early work including a Mrs. Hathaway from a local shipping family. At a New Bedford Concert Hall, he also used the floral images of George Harvey (1800-1878) for a scenery picture shows with a Drummond Light, a lantern that allowed one picture to fade into another. In 1853, he returned to Dusseldorf where he studied at the Royal Academy with landscape painters Andreas Aschenbach and Karl Friedman Lessing. Some of his fellow students were Emmanuel Leutze, Sanford Gifford and Worthington Whittredge, and they all learned much attention to detail, respect for composition and skilled drawing. During this period, he traveled extensively in Europe, especially Italy, and companions were Whittredge and Gifford. He completed many picturesque Old World scenes in the style that later became his trademark. In 1857, he returned to the United States and painted the White Mountains of New Hampshire, and in 1858, exhibited for the first time at the National Academy of Design in New York. His fourteen entries included, Lake Lucerne, which was one of the biggest in the exhibition. That same year, representatives of the Boston Atheneum, purchased his painting, The Portico of Octavia, Rome, for $400.00 and this was the first museum purchase acquisition of his work. In January 1859, he heard a lecture in New Bedford on the American West by Bayard Taylor, famous traveler and lecturer, and this exposure stirred an interest that played a large part in his future career. Meanwhile, he had settled into New York City where he lived and occupied a studio in the Tenth Street Building, which had 25 studio spaces and became well known for its prestigious occupants. He remained in this studio space until 1881, when he moved to 1271 Broadway to the Rensselaier Building. A year later he found the subject matter that set the course of his career. He joined a western military expedition led by Colonel Frederick W. Lander to survey wagon routes in the Rocky Mountains and Wyoming. 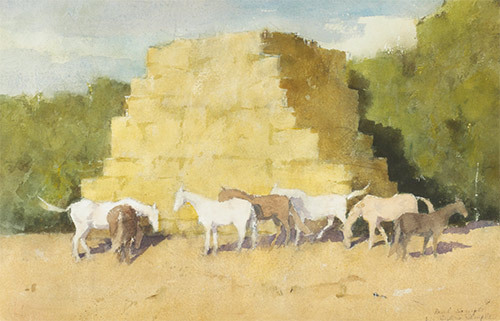 From sketches and artifacts such as buffalo hides and Indian items, he painted studio western scenes including landscapes, Indians, and wildlife in the traditional style he had learned in Europe. His first big western painting, 1860, had several titles: The Base of the Rocky Mountains, Laramie Peak and/or The Rocky Mountains. (It should not be confused with the 1863 painting, The Rocky Mountains, now in the Metropolitan Museum.) The 1860 painting did not generated much reaction when it was exhibited at the National Academy nor did it find a buyer, but it did establish “its creator, however, as the artistic spokesman of the American Far West” . . . (Hendricks 94) Subsequently the painting was lost, having been loaned to a Buffalo New York high school in 1922. In 1861, Bierstadt and his friend from Dusseldorf, Emanuel Leutze, got permission to visit army camps around Washington to paint Civil War scenes, and from this experience plus an 1863 visit to Fort Sumter, Bierstadt painted war theme canvases including The Bombardment of Fort Sumter. During this period, he also visited the White Mountains of New Hampshire, and made plans for a second visit to the American West, which involved securing welcomes at U.S. army forts by getting travel permission from Charles Sumner, Secretary of War. This second trip West was with his friend, Fitz Hugh Ludlow, whose wife Rosalie Osborne, Bierstadt would subsequently marry in circumstances that ‘titilated’ New York society. Ludlow was the son of a Presbyterian absolutionist minister of Poughkeepsie, New York, and was a writer of a controversial but best-selling book, The Hasheesn Eater. The publication was praising of hashish and described his positive experiences of being one of the first westerners to use the drug, which had been used in India and other countries for over a thousand years but was first introduced in 1839 in America. As a result of notoriety for the book, by the mid 1850s, he was highly prominent in New York society. He was married to Rosalie Osborne of wealthy family of Waterville, New York, It has been suggested that Rosalie and Bierstadt were showing interest in each other at the time of the 1863 western trip of the two men. In 1863, with the understanding that Ludlow would take copious notes for a book to be published and possibly with the idea they would come to some conclusion about Rosalie, Ludlow and Bierstadt set off from New York in April 1863 from Atchison, Kansas. There they got supplies and in late May the men left on the Overland Trail through Nebraska, Colorado, Wyoming, Utah, Nevada and into California by July 17. Painters Virgil Williams and Enoch Wood Perry joined them in San Francisco for a painting excursion to Yosemite during the month of August. They camped in a meadow on the Merced River and near the base of Yosemite Falls, and were back in San Francisco by mid September. Then they journeyed to Oregon, leaving from Portland to catch a steamer from San Francisco that returned them to New York on December 17, 1863. During this time, Bierstadt’s name came up for draft into Civil War service, but he paid an exemption of $300. Three years later, the Ludlows were divorced, and Rosalie Ludlow married Albert Bierstadt. From the time of his trip with Bierstadt, Fitz Hugh Ludlow had deteriorated mentally and physically. Allegedly he was abusive to Rosalie, indulged in excessive alcohal and hashish, and decamped to Saint Joseph, Missouri with another woman. He died in Switzerland in June 1870, having married a widow from Maine. For Bierstadt, the Yosemite paintings were such a sensation that he became immediately famous. In 1871, he returned to California and stayed for three years, exhibiting in local galleries and with the San Francisco Art Association. He also returned in 1893 after the death of his wife. In 1865, he built a thirty-five room home of granite and wood on the Hudson River near New York City. He named the place “Malkasten,” which was German for paint box and referred to the name of an artists’ gathering and exhibition place in Dusseldorf during his student days. However, he seldom worked from his home, preferring his New York City studio. On November 10, 1882, “Malkasten” with many of his paintings was destroyed by fire. In the 1860s and 70s, he earned the highest prices ever achieved by an American painter, and the US Congress allotted $20,000 for one of his paintings. In 1867, he had a grand tour of Europe and England including a special audience with Queen Victoria. His painting, Among the Sierra Mountains, California, was exhibited at the Royal Academy of London with mixed reactions as some thought it overtaxed the viewers’ minds and imaginations. He received the Chevalier of the Legion of Honor by Napoleon III and the Order of the Stanislaus from the Czar of the Russias. Returning to America, the Bierstadt’s visited his photographer brother, Charles, and her sister, Esther, in Niagara Falls, and also went to New Hampshire for more painting in the White Mountains. In 1871, the Bierstadt’s went to California, staying for two and a half years. They stayed primarily in San Francisco, and were much sought after socially. He painted in the Sierra Nevadas, Lake Tahoe and Yosemite, and Colis Huntington and Leland Stanford, two of California’s most prominent businessmen, bought paintings from him. However, toward the end of the century, beginning in the 1870s, his career had major setbacks with the increasing influence of the Barbizon and Impressionist styles from Europe. Bierstadt’s painting style was increasingly considered old fashioned and foolishly romantic. However, he was asked to contribute a painting to the newly established Pennsylvania Academy, and sent Mount Adams, Rocky Mountains. He also received a commission for paintings for the U.S. Capitol Building and contributed historical scenes, Landing in Monterey and Discovery of the Hudson. He also entered work in the Philadelphia Exposition of 1875, but the public’s reaction was less than enthusiastic. For income and because of lack of interest in living there, the Bierstadt’s rented Malkasten, their home on the Hudson River. He took a studio and housing space in the Rensselaer Building at 1271 Broadway, and there held exhibitions for sales of his paintings in circumstances described as elegant and commodious. The couple traveled in Canada and Colorado, but Rosalie, who had tuberculosis, spent much time in Nassau, where the climate was better for her health. He did paintings there, and in 1875, returned to California. From 1878 to 1879, the Bierstadts traveled in Europe, and then she was in the Bahamas for eight months while he again traveled west including to Yellowstone and Salt Lake City. The next few years they both traveled together some, including a return to Europe, but she spent increasing time in Nassau, and he took several more trips including to Canada, Alaska and Europe. He was very disappointed when his entry, The Last of the Buffalo, (now at the Corcoran Gallery) was rejected for the Paris Exposition of 1889. However, this canvas did have the consequence of stimulating an official census of the buffalo population, which was estimated to be 60 million at the time Columbus discovered America and was down to about 500 when Bierstadt did his painting. Resulting from the census was a plan of government protection. On March 1, 1893, Rosalie Bierstadt died. She was fifty-two years old, and although she had been ill for the last years of their marriage, had reportedly been a much-loved companion of her husband. A year later, he married Mary Hicks Stewart, widow of David Stewart, a Boston banker and father, by an earlier marriage, of Isabella Stewart Gardner, prominent art collector. Reportedly this marriage was happy, and for a wedding gift, Albert gave her his historical painting, Landing of Columbus, which after his death, she gave to the Museum of Natural History in Washington DC. The couple lived in New York at 322 Fifth Avenue, and he kept a fairly regular schedule of painting, although the popularity of his work declined. They traveled to Europe several times, and were entertained by Queen Victoria on the Isle of Wight. Although his wife was wealthy, they kept their finances separate, and in 1895, he declared bankruptcy. Seven years later, on Febraury 18, 1902, he died in New York City, having just returned from a walk. His body is buried beside his parents in the Rural Cemetery of New Bedford, Massachusetts. For several decades after his death, he was largely forgotten in the public mind. But he has been rediscovered in the late 20th century and stirred interest in many collectors, especially his paintings of the American West. Everson Museum of Art; University of Michigan Museum of Art; Muskegon Museum of Art; Kalamazoo Institute of Arts; Dennos Museum Center; Michigan Historical Museum; Grand Valley State University Art Collection; Aquinas College Art Collection; Calvin College Art Collection; Grand Rapids Community College; Michigan Supreme Court Historical Society; Spectrum Health Systems, Grand Rapids, Michigan; Ferris State University, Kendall College of Art and Design, Grand Rapids, Cooley Law School, Grand Rapids, Michigan Campus. 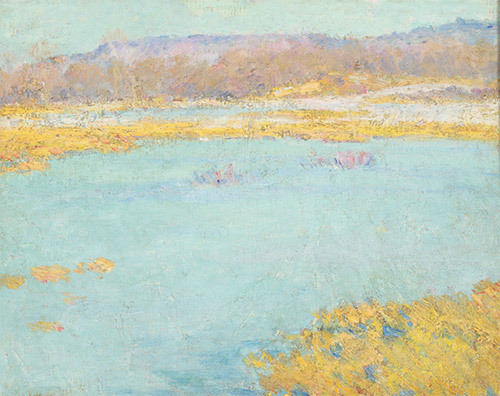 E. Jane Connell, “Mathias J. Alten: Discovery of an American Impressionist”, American Art Review, February 2011.